'Harbor Hill', the Clarence Mackay estate designed by McKim, Mead & White between 1899-1905 in Roslyn. Mackay was chairman of the board of the Postal Telegraph Cable Co., president of the Commercial Cable Co. and Commercial Pacific Cable Co. and held numerous other positions with other companies. He was also chairman of the board of the Philharmonic Society and St. Vincent's Hospital in NYC. Click HERE for more on 'Harbor Hill' (including pictures of the estate grounds and outbuildings) and HERE to see where 'Harbor Hill' stood on google earth (demolished in 1947). Pictures from American Estates and Gardens. For those of you who love the house, or want to know more about life on one of theses great places, I highly recommend "Harbor Hill, Portrait of a House" by Richard Guy Wilson. Great period photos and interviews with former staff- lots of the sort of day to day details that are typically lost. Although it's not "here or there", I find the interiors of Harbor Hill surprisingly unappealing with a heavy Edwardian grand hotel feel to most of the rooms. Not my favorite among McKim Mead and White's work. A fascinating work---as Magnus says, very Grand hotel. The book is a great read, and gives much insight. It also answers anonymous's question about influence----Mrs. MacKay, barely into her 20's when the house was built had solid opinions and desires about almost every single aspect of architecture and decoration. After Mrs. MacKay left Mr. MacKay and married Dr. Blake, her houses were much simpler, interestingly. As if she'd gotten all that grandeur out of her system before 30.
are we all talking about the same place here? 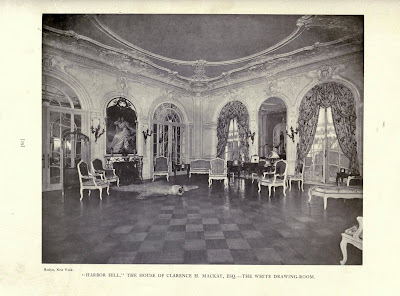 how can you look at the "white drawing room" and call it "hotel like" i don't think so. and there's another photo of the hall not looking at the iconic stairway somewhere in cyberspace - man, its monumental - overpoweringly grandiose. definitely not elegant but like the rest of this place - a statement of "i've go the money and i'm going to show it off". love those stables and the fountain (which is in kansas city now btw). this is one of those places that i can't comprehend the mentality that could take out a few things and then just blow it up. overloads my brain circuit!! Interesting that they wouldnt have water in the fountain. You can tell by the trees in the background that it is not winter. I once had a friend who was obsessed with wanting to know how big Harbor Hill was. He took the floor plan measurements and elevations and laid them over the plans for the, Vanderbilt's Breaker's in Newport and it basically was the same size in footprint and height of the Breakers. if you have ever been to Newport and seen the Breakers from a distance or up close, you can see how it towers above a person and the other large mansions around it. If you zoom into the front door picture of Harbor Hill, or look at a book, you can see a doorknocker that is almost near the bottom, where a person would be. 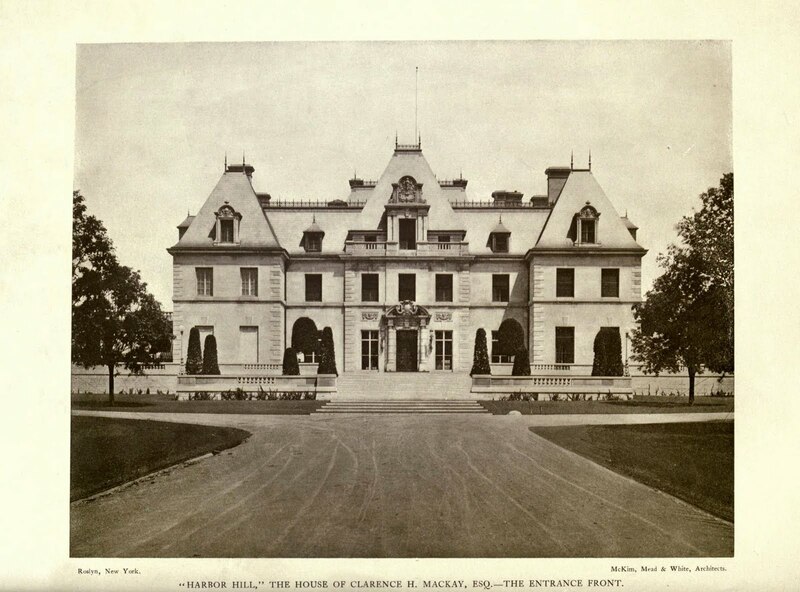 The scale of Harbor Hill was Huge, One of the largest houses in America. If one is ever able to see the interiors of the private University Club on Fifth Avenue the interiors are very similar with the oak and columns. That building was done about the same time by the same firm. Also if you look at the Grandfather clock on the staircase, you can get a sense of how big the stairs were. That clock if you know antique clocks and anything that was bought for this house would not have been a dinky little thing from Ethan Allen. The gardens at Harbor hill went thru a couple of tweaks. Pictured hear was the first c. 1902. 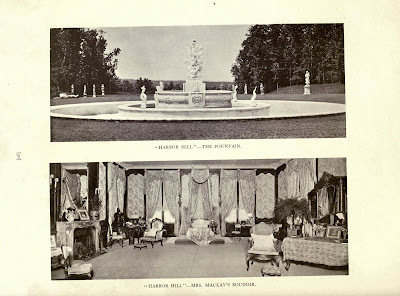 The fountain in Kansas City is the 2nd c. 1910 when Jacques Greber redid some of Guy Lowell's work. Basins look very plain on the 2nd compared to the lush work on the 1st. 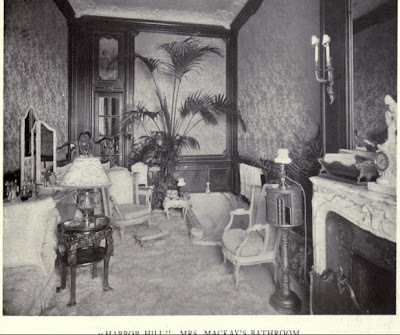 No one is questioning the sheer scale of the home, but as you say yourself, the interior is on par with the University/Century Clubs, (where the hotel tags come to play) and lacking the sense of other M,M&W's grand works-Tiffany Mansion, Ochre Point/Southside, Osborne Residence,and even Naumkeag; with a more institutional interior. These leaves McKim's and Mead's pen all over it. The romance of the exterior is 'shut out' from entering inside. Yes, the interiors can seem hotel like and many of the great houses are. They were built for show and grand entertaining and impression, just as a grand hotel would be. One could never call the first floor of the Breaker's cozy. But the real living of these houses was on the second floor, where most of the days were spent, just like a real hotel, you only went downstairs for socializing. Often the second floors were kind of low key and boring, The second floor of the Breaker's, designed by Ogden Codman, is not boring, but much more livable. Too bad there aren't many photos of the second floor of Harbor Hill, besides Mrs. Mackay's rooms. But in later photos you can see a lot of more interesting objects displayed all over the ground floor, making it less spartan, than the earlier photographs. I think the only room on the first floor really used was the library, which probably served as their living room. That's my point....For a McKim, Mead and White commission it's off a bit. 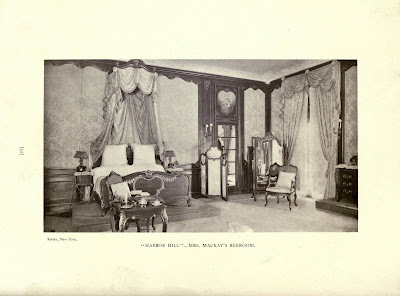 White's interiors were not institutional, and yes; Harbor Hill's 'White Room' is probably the kissing cousin to Newport's Rosecliff. The scale is somewhat similar if not a 'bargain copy' of it. I've been in close to thirty extant McKim, Mead and White creations and can say Harbor Hill was not one of their best...........Newport's Berry Hill beats this place hands-down. Mrs. Mackay was always after Stanford White about one thing or another, often writing long letters explaining just how it should be done, demanding it be just so. Maybe the house should be attributed to McKim,Mead,White & Mackay. When the stables where built, they hired Warren & Wetmore. You're probably spot on with that assumption, Mr. Lawrance, spot on Sir...! 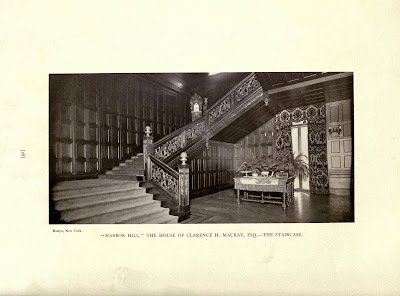 Concerning The Breakers (Newport); heck even the Third floor was comfortable living, if we could indeed ask (the late)Countess Szapary or her children. Farlands updated - plus additional tags for the estate - gate lodge and some garden features. Oheka? I have no info it had a court/playhouse???? What do you have? This has to be LI's greatests loss. Such a beautiful house (exterior. I never did get the interiors). Based Oheka on a brief mention by Monica Randall in the chapter on Play Palaces. However, in the context of the sentence it could also indicate an outdoor court. What about any of the Veratons, C.K.G. Billingsley or Cassleigh? Still not clear on Payson. Anonymous 8:15, and Gary Lawrence. 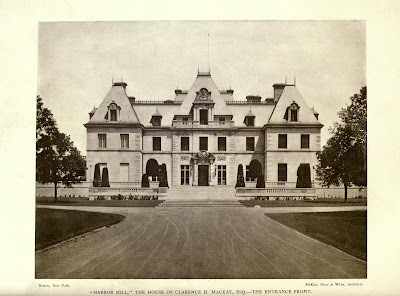 I'd like to add a couple of caveats and reminders here: Although Stanford White was one of the best decorators of all time, and could create layered, rich and innovative interiors, some of the interior work, particularly in their more palatial houses, was farmed out to other firms, as was the case with many of the palace houses--Glaenzer, Alavoine, Codman, all did interiors for McKim, Mead & White commissions. And Harbor Hill is not the firm's only institutional house. I offer up the Vanderbilt House at Hyde Park as exhibit A: Truly, strip away some of the furniture and tapestries, and you've got the layout and appearance of a grand county courthouse. And the interiors were farmed out to two or three different firms, including Ogden Codman. And yes, Mrs. MacKay was a particularly involved client, but as Gary Lawrence points out, these houses were run like hotels. For all it's magnificence and grand vistas, the Breakers is a very urban building. 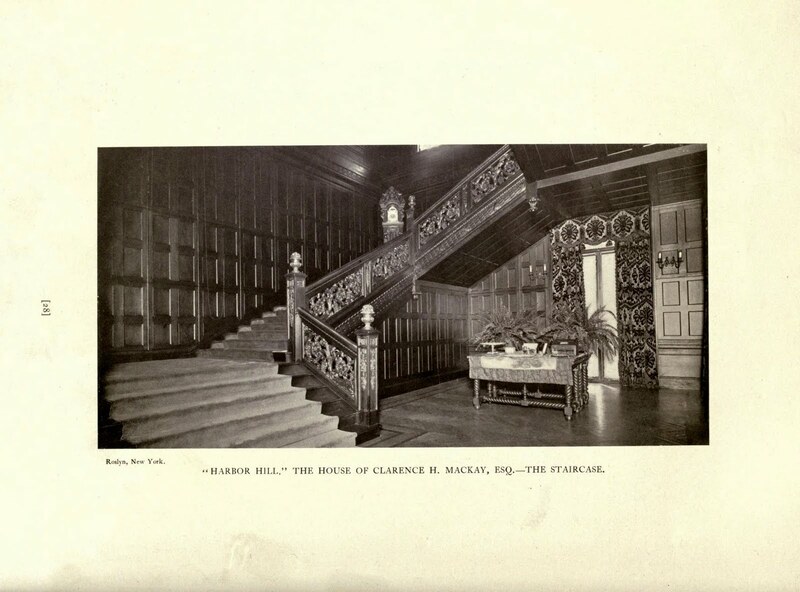 Anyone have details on Clarence Mackay's 1924 Gatsby-like shindig?